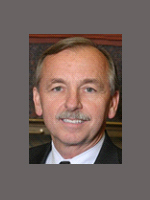 Newell was first elected to the Danville Town Council in 1995 and elected Mayor in 1999, 2004, 2008 & 2012. His community involvement started with the Town over twenty-two years ago with serving on Danville’s Architectural Design Review Board and on the Danville Planning Commission. Regionally, he serves as the vice-chair of the Tri-Valley Transportation Committee, Danville’s representative to the Association of Bay Area Governments, ABAG for eight years, served on the Tri-valley Affordable Housing for ten years, and currently serves on the Tri-Valley Transportation Commission, Contra Costa Transportation Authority, and Southwest Area Transportation Committee dealing with issues affecting Contra Costa County and the Tri-valley areas. He is a passionate advocate for providing quality public education. He is a graduate of Leadership San Ramon Valley, past president and currently serves on the Board of Directors, a member of the Danville Area Chamber of Commerce and a member of Danville-Sycamore Valley Rotary Club and past-president. He also serves on the Board of Directors for Discovery Counseling Center. Mr. Arnerich is also a graduate of the League of California Cities Mayors & Council Members Academy for Leadership and Advanced Leadership. Newell holds bachelors and master’s degrees in architecture and urban design from the University of California, Berkeley. For the past 34 years he has been a professional architect who is the principal owner of an architectural firm with offices in Oakland and Los Angeles and serves as President/CEO. He is married to his wife Janis for 39 years, a former elementary school teacher in Danville and currently an elementary school principal in Orinda, and together they have two children, both graduates of San Ramon Valley High School.